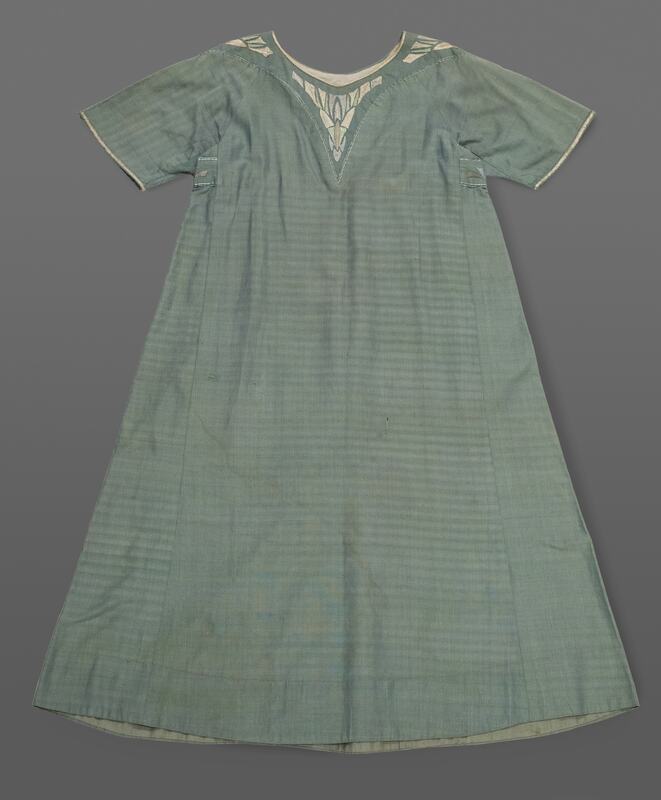 Worn over a dress or blouse and skirt, an overall like this one provided protection for the kind of work or pastime that did not involve getting dirty. 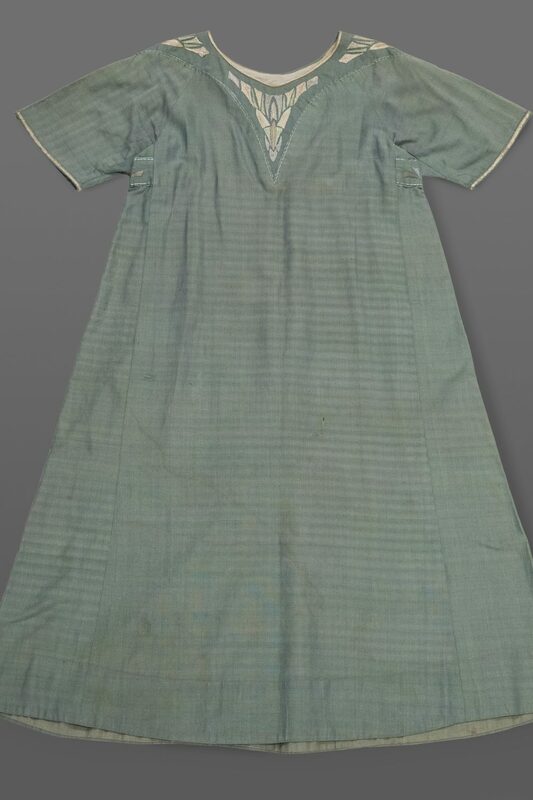 It shows the influence of artistic dress in its stylised hand embroidery, the subtle shades of its shot fabric, and the loose, simple style and construction that evoke the dress of the Middle Ages. 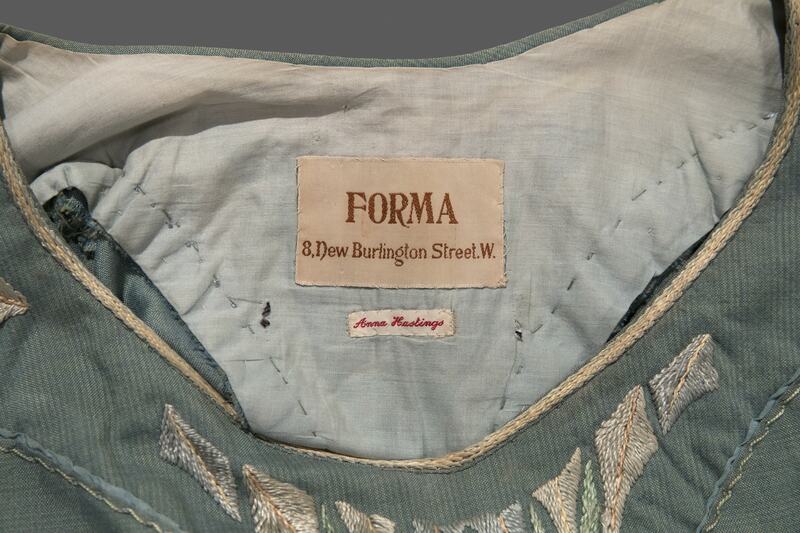 Little appears to be known of Forma, a dressmaking establishment in the Mayfair area of London that probably specialised in garments of this ‘arty’ type. 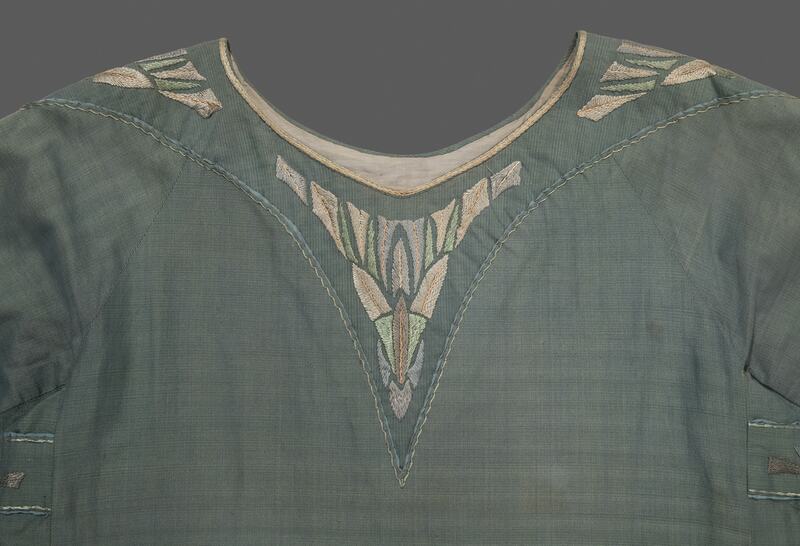 The Victoria and Albert Museum owns a Forma outfit of circa 1905 that comprises a long loose silk underdress below an embroidered velvet tabard which are distinctly medieval in style (http://collections.vam.ac.uk/item/O74916/dress-forma/). 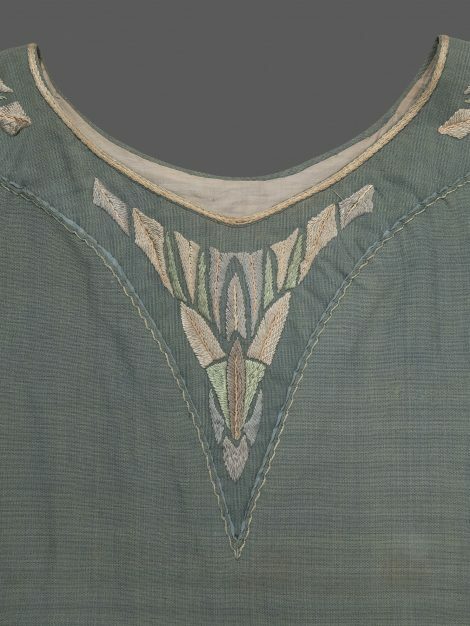 A very similar loose overall with embroidery at the neckline and shoulders, probably designed by the dressmaker Amy Kotze, was displayed at the Women’s Social and Political Union Exhibition of 1909, and can be seen on the second mannequin from the left in a photograph taken by Christina Broom (https://collections.museumoflondon.org.uk/online/object/436965.html) . The WSPU’s founder Emmeline Pankhurst and her daughters are known to have dressed in garments of an artistic character as did Mrs Millicent Garrett Fawcett, leader of the National Union of Women’s Suffrage Societies. With the passage of time the artistic and political connotations gave way to more prosaic use. In her autobiography Selective Memory of 2007, the journalist Katharine Whitehorn recalls her schooldays at Roedean in the 1940s, ‘There was a tendency to keep up pre-war traditions: the uniform was a strange navy garment called a djibbah, a loose tunic with a V-shaped inset at the neck … In the evening you changed into another one made of velvet or silk with embroidery in the V’. 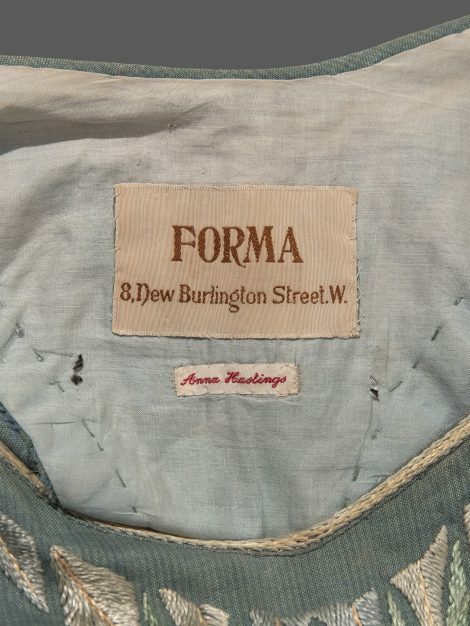 The woven name tape in the Forma overall suggests that it may also have been worn by a college student or school pupil at some stage of its life.